At 5:00 this evening, I realized I hadn’t taken my Zofran today. Normally, I take a pill around 1:00 to get me through the afternoon and evening. The fact that I didn’t notice that I had forgotten my normal dosage speaks volumes to me. A few of you requested belly shots. Here’s one I took late last week. Let’s call it 12 Weeks. I also feel like I need to add an addendum to the post I wrote at 5 Minutes for Parenting a few weeks ago, when I felt like I was showing and requiring maternity clothes WAY too early for comfort. 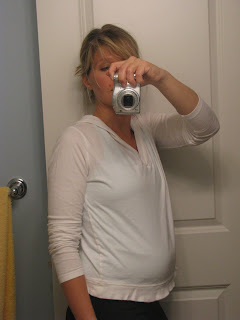 I went through my maternity clothes about 20 minutes after I published that post. (The comments on it are hysterical and encouraging, by the way. You should read them.) The good thing is, thanks to four previous pregnancies and a sister who shares maternity clothes with me, I have a complete maternity wardrobe. In fact, I think I might have more maternity clothes than regular clothes at this point. But the next morning, when I went to put on a maternity shirt, I realized with a start that my rather large baby bump disappeared into nothingness under the tent that is a maternity shirt. In short, I looked ridiculous – like a woman trying to pretend to be pregnant. So with a sigh of resignation mixed with relief, I went back to my regular wardrobe and decided I would spend a few more months continually adjusting my normal jeans and sweaters and fending off wayward looks from strangers. My Pregnancy Journal post over at 5 Minutes for Parenting today is about marking anniversaries. I have now officially passed the time when I miscarried in 2007. It’s always a sad yet hopeful moment to make it beyond that point. Maybe you can relate. See you there. I had to wear some maternity clothes - at least the pants - pretty quick because I threw up so much I couldn't stand to have anything restrictive on my stomach! It makes me smile to imagine what cuteness we'll be seeing pictures of next summer! Don't you just hate this in between stage when it comes to fashion? Ugh. The good news is that if you've shopped for non-maternity clothes lately, so many of the styles are accommodating to an ever-expanding middle. Acceptable when you're pregnant, not so much if you're not. Ahem. I'm headed over to read about passing the point when you miscarried. I know all too well the relief that comes with that. And yet, I still had to give my pregnancy over to the Lord daily. Praying for you, friend, and praising the Lord that you were able to go without Zofran today! I agree with Sarah ... adorable. Bella Band time!! Do you have one? Love that thing. Welcome to "advanced maternal age" I had to see a specialist every time along with my regualr OB and he would always ask why I was there, I would tell him "becasue I am old" He would get a kick out of that. Congrats on getting past that first trimester !! I was surprised at how many pairs of pants I found in the regular part of the store that had a draw string. I just skipped right over those pants when I wasn't pregnant and didn't even notice them! I found tons of cute stuff that wasn't maternity to wear the first two trimesters. A lot of styles now also are great for being pregnant. I have about five non-maternity sweaters that just have a couple of buttons at the top or one in the middle that look cute as maternity, even though they aren't! Very cute picture! It's hard to believe you are really pregnant again!! :) I am a little bummed that I am not pregnant though too (don't tell mom! )- I thought it would be fun to be pregnant at the same time... but I am so not ready to be pregnant yet! And then our maternity wardrobe would be cut in half! :) Can't wait to see you in person at Christmas. The time in limbo is the worst!! I had that, and it drove me nuts. Some maternity clothes fit, and some didn't. Some regular clothes still felt comfy, but most weren't. It is not fun. You look fantastic! It's hard being in the in-between stages and I think the fitted maternity look is cuter, anyway. I'm so glad you shared a pic! You look fabulous and I'm SO glad you're feeling a bit better!